1. First, please introduce yourself. Tell us your account name from Qualifications/Finals, your alliance, tribe, game style, positioning on the map and your role in Finals 2017. 2. Why did you choose this tribe, game style and positioning? In recent years, I’ve always played as an offensive Teuton, especially on the Tournament (Qualifications/Finals), where the most important factor is how strong your army can become in a limited amount of time. Because of the large number of enemies, it is vital for me to train more armies on the account, as fast as possible (considering the costs and training time, only the Teutons would allow me to do this). I’ve joined this round of Finals 4-5 hours after the official start time, so I can start directly in an area closer to the WW. I knew I would be Dacia’s WW builder and because of that I wanted to start there and secure the area, to eliminate potential problems – which I have done successfully. 3. Tell us something about the person behind the account. My name is Emilian, friends call me Emi. I’m 38 years old and I live in Scotland with my beautiful family, for more than 10 years. I have an understanding and calm wife and two beautiful and healthy children, thank God. 4. When did you start playing Travian and how did you discover the game? I discovered the game in 2004 by following an advertising on the internet. I started playing from the first com1 server and I could not stop until today; it’s a ‘serious addiction’. 5. Tell us how the road was in the game – from the beginner stage to the current performance. From 2004 until 2011, I only played on normal speed servers (1x) on COM domain. I was a beginner for 3-4 years, I received instructions from the leaders, I executed them, I learned a little bit from each of them and since 2008 I started to lead and coordinate alliances and large groups of people. To be very good at Travian you have to invest a lot of time. I can say that the best performance and the most powerful accounts that I had were in 2008-2010 – that was my peak – but at that time I did not have children and everything was simpler. Today, after 14 years of Travian, I can truly say that I have done everything I could in this game. 6. What motivates you to participate, to get involved, or succeed in game? Motivation is the number one factor behind anyone’s performance. For me, the only Travian server that still creates the best environment and which deserves the investment of time and money is the Finals. But I wouldn’t be able to play and I couldn’t do anything notable without the help of my team – the group of friends that I’ve made in this game and which are playing by my side for years. They are people of character who join the Finals every year at my call, who are founding villages where I tell them to, who are sending resources to the accounts I tell them to, who are sending all their troops where I tell them to, without even asking why – they are the reason why I’m still in Travian. The moment I’ll have no team, my motivation to continue playing will also disappear. 7. How was your team formed for The 2017 Tournament? Who had the initiative and what motivated you? The Dacia Confederation consists of several alliances / teams; each leader has gathered their people and joined the Finals to give a helping hand. My team was forged over time, especially in the last 4-5 years on Qualifications + Finals. There are very few players in my alliance who can say they have played only 1-2 servers by my side; most of them have played for over 5 servers. Even if we are not young anymore and we don’t have time now to talk on Skype for hours, the fact that there is a group of veterans, that we always play together and know each other for years, greatly facilitates the communication and the good progress of the alliance. The alliance is formed around me and we motivate each other every day to be better today than we were yesterday. 8. The number of Dacia’s players has increased compared to the previous years. How did you draw/attract the players into your alliances? Before the Finals started, we have invested a lot of time in preparations and marketing. I played on rox28 and I promoted the Finals in every quad, I also played comx and I promoted it among the Romanian players. I played the 2017 Qualifications and I organised Dacia quite well – kept the people active, motivated and kept their hopes up. There were other leaders as well who got involved before the round started and who played regular servers like ro2, ro4, in order to recruit new players. It was clear that we would need fresh blood on the Finals and I can say that this round we did very well when it comes to recruitment, as proof that we had a record number of Romanian participants in Dacia alliances. 9.How do you manage to get the best out of each player? How did you motivate them throughout the round? In order to get good results from as many members as possible, we have paid special attention to the communication, internal policy, diplomacy and strategy of the server. Before the Finals, I made a blog full of useful materials, tutorials, examples from good players, I analysed what others did better than us, where we did wrong and what we can do to make Dacia the best team in the Finals. In my alliance I also organized contests with rewards in Gold, I organized a push to over 30 defenders who were usually never helped, but they were always asked to help others, I always monitored the number of troops on the accounts, I gave them personal goals and I monitored with a Google LIVE document the accounts’ production, which has created a good competition between us… I’ve been trying to find ways to involve as many players as possible and keep them active and motivated. 10. How did you make the recruitment / distribution of players for your alliance(s)? Was nationality the main criterion? In Dacia alliances, nationality was the main criterion. All Romanians who came to help Dacia have found a leader they could work with. If X did not like Emerik, he went and played in the alliance of another leader. As long as he helped and played for Dacia, I was very pleased. I surpassed the stage when I was trying to be liked by everyone and be a popular leader. I prefer to be unpopular but to have results. You cannot please everyone, especially when I have to make decisions for the team; this will always affect one or more players. 11. Both in the Finals 2015 and the Finals 2017 the winning team, of which Dacia was part, was made up of several nationalities. Do you consider the formation of multinational alliances or the expansion of diplomatic relations in the future? Please motivate the answer briefly. In recent years, the Czechs, Hungarians and Ukrainians have always been with us (Dacia) and we have a good history of cooperation with the players and their leaders. Unfortunately, all these teams are in decline, especially as number of players. This year we have also brought to Dacia a strong Croatian alliance (Croatian Swingers) and a mercenary alliance – checkerB (made up of a few Arabs, a few Finns, some Indians). The reason I turned to these allies is mostly related to endgame. From the beginning, we knew we needed 40 million deff on plans, and you cannot get those numbers without a strong confederation behind. 12. How have the alliance and player roles been defined in Final 2017? Did you know from the beginning how you want to play or have you adapted your style during the round? 13.Have there been specialized alliances within your team? If so, which ones? I have assigned clear roles to Dacia alliances from the very beginning. For example, in my team I had over 100 accounts (2 alliances +) and we all entered the server 4-5 hours later. We wanted to be allocated as far away from the center as possible, because our pre-established role was to found the WW, secure that area, and to prepare for the endgame with millions of deff units. Besides that, we have also taken good care of artifacts. From our quad we only missed one Artefact of the Fool; Other than that, we took everything there was and everything we needed. There were alliances that were sent to the center (Dacia K + Dacia E), alliances that were sent in the battle zone to hold the front (Dacia NV, Dacia Z) and we had alliances that went to the wilderness and made hammers and massive deff. Maybe there was a need for small adjustments and adaptations to the reality from the field, but we are not very adaptable. Which factors made these actions possible? Share your opinion with us. The Romanian players from Travian have a very good potential, they only have to be motivated and this year the Dacia Forever project was a successful one. The diversification has also made a lot of difference (Romanian players coming from both normal and speed servers – rox and comx) and the competition between the top Dacia alliances was a good one, it produced good results; many people deserve to be congratulated for their involvement. We worked hard and we are now world champions. 15. In this interview given to Safiren, you have expressed your opinion about the other coalitions / alliances present in the Finals and their performance in the game. Congrats to your coming victory! I hope you will answer a couple of questions. 1. Both the Turkish meta and the Russians was divided this round, which made you the biggest working meta. What significance have that had for your victory? 2. SPQR have been a buffer between you and the Russian Union in SouthWest. How do you evaluate their input for the outcome? 3. WINter as enemy in your own quad. Your opinion about them? 4. NorthEast have been the weakest quad this server with no real influence. Why? 5. The Rainbow Union (Turkey, Arabs, China, Vietnam) in SouthEast did poorly against the alliances from Poland and Russia. The later was heavy outnumbered from beginning but seems to have had no problem to be the strongest force in that quad. What made the difference? 6. What do you want to say to the players in this Final? 1. To win world finals you need the support of a big meta, there’s no other way and we’ve learned that lesson from the past. But in order to form a big meta and keep all leaders and their players engaged and motivated, well that’s the biggest challenge a leader can have. NW Meta created around Dacia had it’s own problems, we just faced them with a lot of patience and experience and somehow we’ve managed to arrive in endgame better prepared than anyone else. I have no doubt that Russian meta will learn also from this year’s defeat and they will come back stronger next time. As for Turkish meta I am still not convinced, they showed us strength and ability in qualification, but in the Finals, Turks had little achievements over the years. 2. SPQR had a very important role to play this finals and they’ve done it very well. Before the start of the finals, I had several chats with Italian leaders and I knew exactly what will happen, I was also invited to come with Dacia in SW to have fun in that quadrant, but I decided to gather a strong team in NW and win the server instead. Italians helped Dacia without having direct motivation to do so, nevertheless Dacia had more defence than all other meta’s combined and more hammers than all the other metas combined also… so Italians did not make us winners, it was mainly our work and ability from the start to finish. 4. NorthEast is weak for a while already, despite the fact that many strong players can be found in that quadrant, it must be due to lack of vision and leadership. 5. Rainbow Union was created just before the start of the finals and I’m sure the cooperation between alliances and groups inside this meta was poor. Lack of experience, lack of leadership and internal problems always leads to weak teams with poor motivation , hence poor results. Maybe next time, no ? Hard lesson are the best. 6.Thank you all for playing this year’s Finals. Please keep the tournament active and honourable. Do not seek to cheat and manipulate ranks, but rather get yourself involved in epic wars between teams and meta’s. The reward and the experience gained might be worth investing your time and money, but cheating your way up to get some prizes will only bring shame. Kind regards and see you all next time ! What is your opinion about the contribution and performance of alliances that were part of the winning coalition? What have they been noticed by and / or where is there potential for more? Czech Republic – our oldest ally, is in a visible decline. They had very few offensive players capable of taking part in the attack operations against the Russians from Winter meta. They sent less deff to WW than the weakest Dacia alliance, so there is room for improvement… if something does not change, quickly, I do not know if we will have CZ-SK allies in the future. Ukraine – with little exceptions, most members played deff and helped a lot to protect the WW’s construction plan, they also produced some hammers and some other useful armies. A small number of players, but decent results; as always, a trustful partner. HUN – another small partner when it comes to number of players, but which produced some good/useful hammers, sent deff and crop to WW. I only felt them present on the server during endgame. But better later than never.
! CS! – Croatia has returned to the Finals after a 4-year break. I found them on COM qualifications and proposed a partnership for the Finals. They played well, cleared the area, trained a lot of deff. In the endgame, we saw over 10 million Croatian troops on the Dacia’s WW and they sent crop constantly, so they made their duty as allies. I would have liked to see from them more attacks against the Russians (they have fought the whole server with the Greeks in NE, for an area of no interest) and maybe a few hammers for endgame. A very important ally, but they can improve. CheckerB – another group recruited from the COM qualifications, I brought them with the purpose to make some big hammers and to help us in the endgame. They fulfilled their duty to Dacia, but to note: they had at their disposal all the conditions (trainer 1/2, storage, 1/2 diet, they never had a fake on the entire round, they lacked nothing). 16.In the previous years, you have made yourself noticed in the Travian Tournament on the battlefield and within the Dacia leadership. What determined you to build the Wonder of the World this year? Tell us about your experience this year as a WW builder. Did everything go according to your expectations / plan? What challenges have arisen? How did it affect your gameplay? At the beginning of this server, as always, I wanted to run from the responsibility of being a WW builder for Dacia, because I knew it meant many sleepless nights, both physically and materially effort. But I thought about it and I realised I have all it takes in order to produce the best results. I have a great sacrifice capability, there have been countless days when I stayed home all day and did not go to work, to make it all right for Dacia. When I decided to be the WW builder for Dacia, the first thing I did was to buy a new, comfortable desk chair with back support, because I was aware that there would be days when I would be 16-18-20 hours in front of my computer and that’s how it truly was. I bought gold for many accounts in the WW area so we could have NPCs in all villages several times every day and very important, I managed to find some people willing to help me. I want to say thank you to my friend Dragos (Sugarbeast on Rox), my old friend Traian (hitman) who has always been with me and has supported and helped me as much as possible, and to my new friend, but equally important – Ionut (ionut ionut) that has helped day by day as much as possible with deff, crop and with many sleepless nights. Choosing to play WW builder has greatly affected my playing style. I’m used to play offensive with Teutons, with at least 3 offensive armies beside capital army. This turn I trained the attack army in just 2 secondary villages + capital, but somewhere around days 70-75 I started to worry about endgame and instead of maximizing attack armies, I started training Paladins in all villages. 18. What tips do you offer to players who are thinking about building the Wonder of the World for the first time? If you want to be a WW builder in the Finals, I recommend you to warm up on rox / comx (speed servers) to gain some experience. It is necessary to know/understand how to use a croptool, it is necessary to have a budget allocated for the endgame (I have consumed about 8,000 Gold in the last 3 weeks), but the most important thing is to have capable people to help you. And it is very important to be calm and not let yourself provoked by other players. There were a few occasions when I received messages on my Skype account from people that wanted to argue and didn’t hesitate to insult me for silly reasons. If you endorse with them, you lose their support in endgame. No matter if you have different opinions, it’s important to smile, to always reply politely to messages, and to realize that you need every soldier from your team to give all their best for victory. 19. How has your game strategy evolved during the Finals? What about the strategy of your alliance? It was somewhat interesting, because I worked hard on the sim mode/economy at the beginning, held celebrations on all villages, bought many artworks. I reached 10 villages fast and then I headed fast to 20 villages. During this time I started training troops in the 2 secondary villages… But by day 70 I started to dispose villages for the defenders around the WW, because I wanted to have a small population in order to benefit from the morale bonus (population bonus can go up to 50%; it doesn’t help on the WW, but it is active when you are attacked on support/NPC villages, on the village with the construction plan or on capital / 3x/unique diet etc.). I finished the Finals with 6 villages (5,600 pop) although in the first half of the server I was in top 40 pop. My alliance knew what her role was from the very beginning and everybody invested in villages, parties. We were always rank 1 or rank 2 in the population ranking on the server. 20. If you play next year on Finals, what will you do differently? If I will play next year on the Finals, I will most likely return to ultra offensive mode, with 3-4 secondary armies (other villages than the capital, on which you can train troops in great-barracks and great-stable) and I will be a nightmare for Dacia’s enemies. 21. Was there any time during the 2017 Finals in which you (personally, or the ally) fear that your team could lose the server? If so, in what context? We weren’t sure of victory until day 104, when Russians from BAD/Cerber hit Dacia’s WW without making too much damage. Until then, we were very nervous (especially during the night). After we passed 60 million deff on the Wonder of the World, we started breathing normally. In mid-game if you were asking someone about WW 100, everyone was saying we had chances for winning, but that it will be a close fight. We didn’t expect such an obvious winning. 22. Think about the finished round of Finals. If you could change a thing in how the game went, what would it be and why? If I could change something, it would be to bring more offensive players in our cell, and personal defenders in the center. I probably did a wrong call by sending Croatia at y=80; I should’ve recommended to all of them to go to y=40 area and then Dacia would’ve had a real support in close fights that took place in the center in the recent months. Everything else was alright. 23. Name 3-5 players (allies and/or enemies) that you won’t easily forget and mention why is that. I really liked the defensive coordination in WINter / MAFIA / VODKA. Their top defenders: IceScream, Kalibr, ExclusiVe, Witch which played very well, their scouts also played very well, but probably the greatest merits should go to the coordinators: Panda, PristoL, Tommy Gun. In the recently completed game round, I personally worked hard to make a strong attack team and play a lot on the attack book, but the meta Winter was also a very hard to break walnut. Good for them! 24. Who was the most striking opponent (player or alliance) which you would like them to play with you/your alliance? Why? The most striking opponent was Tommy Gun [MAFIA] – offensive Russian player, with 3-4 secondary armies, online every hour of the day and night – a nightmare for all Dacia players who had villages near him. There are more actions that come to my mind now, it was a game round in which we have been attacking very often (there are minimum 30 synchronized operations of Dacia). Perhaps the most interesting and impactful were the early successful actions. After a month we had already started to attack strongly towards the center. After this attack action, I received a congratulatory message from BAD leader – Psycho, who said it was by far the most beautiful and successful action of the Finals until that moment. Another operation that brought results was the conquest of Bingo Bongo’s secondary army village, the leader of VODKA, who was persecuting the Romanian players from his area. 26. Tell us the first thing you think about when you remember the Travian Finals of 2017. Except victory, what will be your Finals 2017 memory? When I think about Finals 2017, I automatically think at the Romanian ‘invasion’. Players from all RO servers have gathered in a single quadrant. We dominated the Finals from day 1 until day 100 and we won in a categorical manner. We managed to do something similar in 2010 when RO domain invaded com5 and we won that round by fighting 3 quads (during that time the COM servers were highly populated and it was a hard thing to do). There have been some compromises, there have been some quarrels – it cannot be otherwise with the hot Latin blood that characterizes us, but we remain with the victory and the good memories. 28. Do you want to participate in the next Travian Tournament? In what team / form of collaboration? It is still too early to think about the next Finals, but one thing is certain: Russia will gather the forces and will be the favourite to win. If we want to have a chance to win, we need a stronger team than the one from this year and sincerely, I doubt that we will be able to win again. But it is possible to play a new round with the Dacia team, and even if we do not win the server, at the end we can feel that we are the winners. 29. Dacia has announced that it intends to donate the prizes to charity. It is a gesture that has stirred the appreciation of the international community, being unprecedented in the Travian Tournament. Who had this idea? How did RO players react to it? Why did the players choose to donate their prizes? Yes, it’s not just an intention. The proposal to transfer the value of the prizes into the bank account of The Give Life Association (Asociatia DARUIESTE VIATA) has already been accepted. I’m happy that Travian Games was open to our idea, they had a lawyer to do a background check and make sure everything was okay. I think they also liked this idea. Who had the idea? I don’t remember, it could’ve been me, but there were other people as well who suggested something similar. I was one of the promoters of the idea to donate the awards; at least here in the UK starting from the first grade and in every group and community people are encouraged to have such initiatives – it’s something normal to make a crowdfunding and to support a cause, therefore I wanted to do this together with my colleagues from Romania. 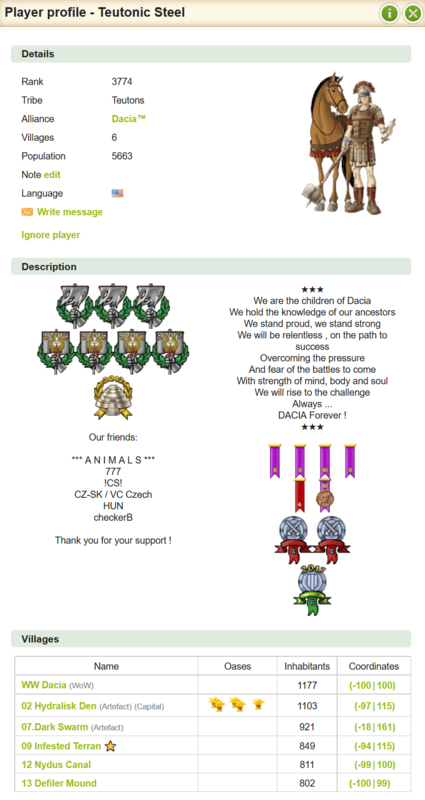 I hope in future we can make different campaigns in the name of Dacia Travian Romania and to support noble causes, no matter if we win prizes or not from Travian Games. Unfortunately, not everybody has agreed on the donation – we still need some work to educate people, but we are on the right tracks. I want to thank everyone that has made this possible, for Dacia’s victory from Tournament Finals and the 6,800€ donation to the Children’s Hospital for Cancer, Bucharest / The Give Life Association (Asociatia DARUIESTE VIATA). ← Food, glorious food: What did the Gauls eat? I extremely preferred the protective coordination in WINter/MAFIA/VODKA. Their best protectors: IceScream, Kalibr, ExclusiVe, Witch which played extremely well, their scouts additionally played exceptionally well, however likely the best merits ought to go to the facilitators: Panda, PristoL, Tommy Gun. In the as of late finished diversion round, I for one endeavored to influence a solid assault to group and play a considerable measure on the assault book, however the meta Winter was additionally a difficult to break walnut. Bravo!